Beijing, February 11, 2018 - Alibaba Group Holding Limited (NYSE:BABA, “Alibaba”) announced today that the company will invest approximately RMB5.45 billion for a 15% stake in Beijing Easyhome Furnishing Chain Store Group Co., Ltd (“Easyhome”), China’s leading home improvement supplies and furniture chain operator. The strategic investment underscores Alibaba’s commitment to furthering the New Retail strategy by taking it into new sectors and driving the seamless convergence of online and offline retail experience. 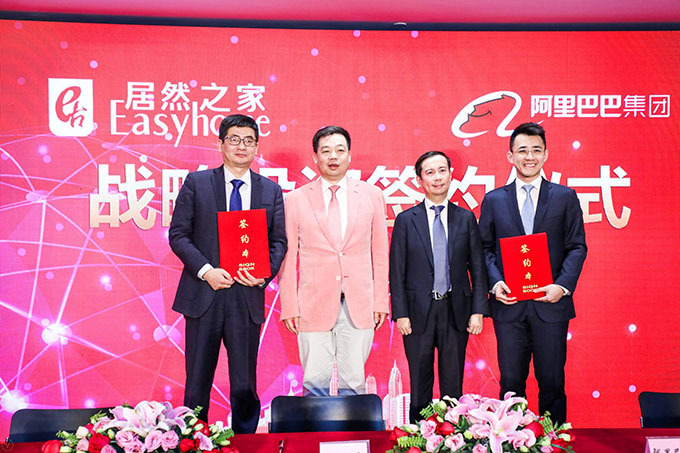 The investment will combine the strengths of the world’s largest e-commerce platform and the rich offline resources of Easyhome. Alibaba will apply its consumer insights, membership program, expertise in cloud and enterprise systems, as well as its logistics platform to support the digital transformation of Easyhome’s 223 stores in 29 provinces, autonomous regions and municipalities across China. From home design to refurbishment projects, the two parties will provide customers with end to end home improvement solutions. The investment is in addition to the success that Alibaba has already achieved in industries of electronics and home appliance, FMCG and grocery, fashion and department stores, and catering. Alibaba’s New Retail is fast becoming an indispensable component of people’s daily life. Founded in 1999, Beijing-based Easyhome is the second largest home improvement supplies and furniture chain operator in China. It also provides home design and refurbishment service as well as operating building material supermarkets. As of December 2017, stores in its building materials and furniture chain recorded sales of over RMB 60 billion.